This dwarf Juniper from Japan is the most popular evergreen in the U.S. 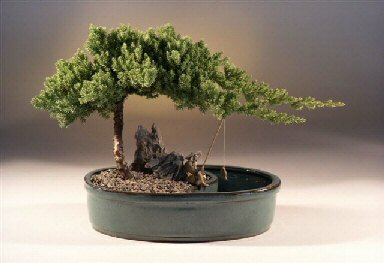 When we think of a traditional bonsai and what it should look like, we think of a Juniper Procumbens "Nana". This impressive trouble-free evergreen is an excellent tree for the beginner. Our tree features a Juniper planting on one side of the pot and on the other side of the planting is a well that holds water. We include a ceramic fisherman figurine along with a fishing pole, line and ceramic fish. As shown. 8 years old, 10" - 13" tall.